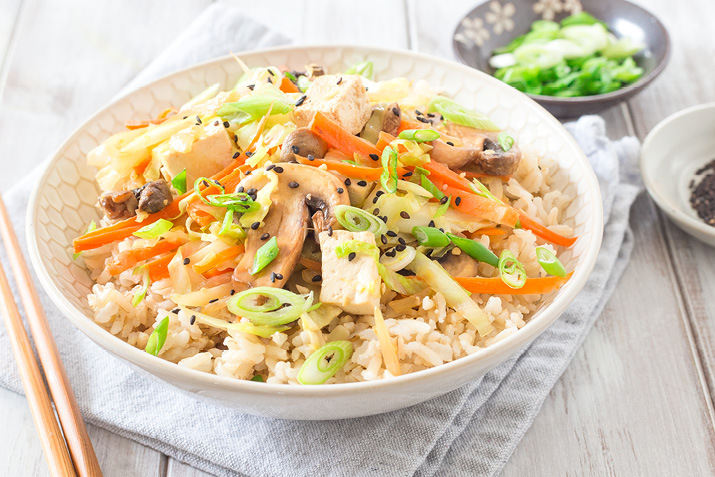 Enjoy the delectable egg roll flavor in this quick, healthy, satisfying bowl. Slice the drained tofu into cubes. In a large sauté pan, over medium-high heat, drizzle the vegetable oil. Add the tofu and stir, and then add the cabbage, carrots, mushrooms and onions. Stir frequently, scraping the pan to keep the vegetables from sticking, for about 4 minutes, until the cabbage is browning and the vegetables are crisp tender. Add the ginger, garlic, tamari and sesame oil and stir for a minute, until the pan is nearly dry. Serve over brown rice, topped with scallions. Serve this flavorful bowl with extra condiments, like Sriracha or kimchi for some pan-Asian street food flavor. Or mix it up by serving the sautéed tofu and vegetables over of hot soba or udon noodles.